Rarely in the history of Japan have public concerns over hate speech appeared so intense and widespread as today. On July 8, the Osaka High Court upheld an unprecedented lower court ruling that denounced as “racial discrimination” the invective spewed by a group of right-wingers at Korean schoolchildren. And on July 24, a United Nations human rights committee urged Japan to prohibit speech advocating “racial superiority,” an apparent reference to a series of anti-Korean rallies in ethnic Korean neighborhoods such as Shin-Okubo in Tokyo and Tsuruhashi in Osaka. But the absence of comprehensive legislation against racial discrimination points to a limit on what Japanese courts can do to crack down on hatemongers, who in most cases are allowed to act with impunity. 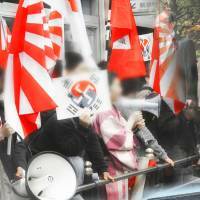 A Kyoto-based Korean school filed a lawsuit against the far-right group Zaitokukai in 2010 seeking damages for a series of rallies it organized from 2009 to 2010 to vilify and threaten the students. “Let Koreans be disposed of in an animal shelter” and “You stink of kimchi” were among the epithets Zaitokukai members shouted through loud speakers outside the school. 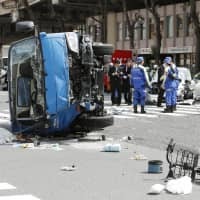 They later posted video footage of the demonstrations online for an untold number of people to watch, an act the Osaka High Court said would increase the likelihood that similar events will be held in the future. The Kyoto District Court had clearly stated in October — for the first time ever — that the Zaitokukai rallies represented racial discrimination, as they rode roughshod over the principles of a U.N. antidiscrimination convention ratified by Japan in 1995. The Osaka court agreed, subjecting right-wingers to a damages payment of ¥12 million. If Japan doesn’t ban racial discrimination, why was Zaitokukai ordered to pay damages? Unlike European nations, Japan doesn’t have a law that bans racial discrimination, including hate speech. But it did become a member of the International Convention on the Elimination of All Forms of Racial Discrimination in 1995. Both the Kyoto and Osaka courts decided that the message in Zaitokukai’s rants constituted racial discrimination as defined by the U.N convention. The problem is that the treaty doesn’t apply to conflicts between individuals, because it’s a public law that governs relationships between the state and individuals. So the courts penalized the anti-Korean protesters by means of other relevant laws. In this case, they declared Zaitokukai culpable for a range of torts, from obstructing the school’s operations to defaming its reputation. 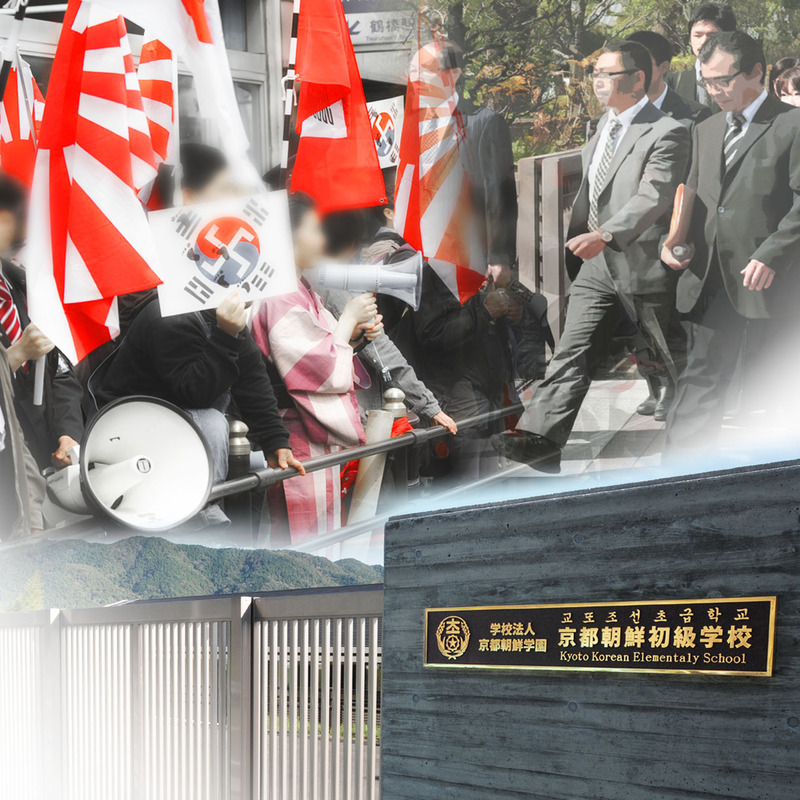 The Osaka High Court said hate speech by Zaitokukai members clearly belittled the convention’s spirit and violated the nation’s tort law to “an unforgivable degree.” The court concluded that by ordering the protesters to pay damages, it understood the convention’s philosophy was taken into account in solving private conflicts. Could a similar ruling be handed down regarding other rallies that have targeted the Korean community? Not likely. The tort law would only be relevant if a specific individual is targeted. When it comes to rallies held in Korean neighborhoods, right-wingers’ verbal abuses are hurled at such a far-flung audience — practically every Korean resident within earshot — that it’s hard to narrow down potential victims to anyone in particular. For the time being, no legal measure can be taken against rallies held in the streets, since Japan has refused to outlaw hate speech out of fear that doing so might undermine the right to freedom of expression. During a news conference last month, Justice Minister Sadakazu Tanigaki decried the rise of racist speech as “extremely embarrassing.” But he nonetheless obfuscated his commitment to enacting an anti-discrimination law, citing a potential clash with freedom of expression. The Osaka ruling, however, said derogatory language used by Zaitokukai went far beyond the realm of free speech. How are these rallies being perceived globally? Megumi Komori, secretariat of the International Movement Against All Forms of Discrimination and Racism, said following the July 24 reprimand that she welcomed the unusually harsh warning from the U.N.
“The government has long maintained, in the face of inquiries from the U.N., that it doesn’t think racial discrimination in Japan is serious enough to require legal prohibition. 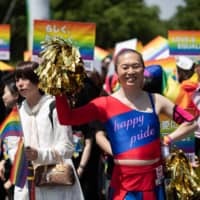 We believe the warnings directly challenged this assertion,” said Komori, adding that it’s time Japan took a step toward cracking down on hate speech. How do other countries deal with people who engage in hate speech? Most member countries of the U.N. anti-discrimination convention have moved to criminalize speech deemed aimed at arousing racial or religious hatred. The United States ratified the convention in 1994. But it forwent an article of the treaty that requires its signatories to “declare illegal and prohibit” organizations that incite racial hatred. So did Japan. The two nations have thus stopped short of making hate speech illegal, both citing the need to protect free expression. How should Japan deal with hate speech? Although the government speaks about the importance of freedom of speech in defending its reluctance to outlaw hate speech, lawyer Seiji Toyofuku argues that, technically, there should be no conflict. Toyofuku thus maintains that hate speech be criminalized but acknowledges that the road to anti-discrimination legislation is bound to face some practical hurdles. “I do believe it’s difficult for lawmakers to come up with clear definitions about what makes one’s remark hate speech,” he said. For example, Toyofuku said, obvious curses such as “Koreans, go hang yourselves!” are easy to forbid. But that’s not the case when it comes to comments verging on political statements, such as those asserting that the Takeshima islets, called Dokdo in Korea, belong to Japan. 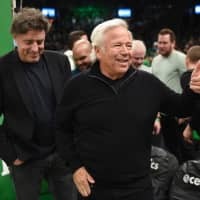 “The bottom line is that whatever law might be enacted, it has to be crystal clear about (what constitutes hate speech),” he said. Ambiguous wording in legislation would confuse the public on what speech makes them a lawbreaker, Toyofuku said, and many would simply refrain from speaking out under such a situation, as was the case in Imperial Japan.